Now this is going to be a weird segue, but when your babies are sick, all you want to do is kiss them and make them feel better. So for my ailing baby, I cuddled her as much as I could and made them these Nutella Hazelnut Kisses. These cookies are decadent and really hits those chocolate cravings. And after a sleepless night I needed that hit of nutella. They're so simple to make. There's only 5 ingredients! But they do require a bit of time, which was fine by me because it gave me time to cuddle her in between. For the cookie, I used dry roasted Hazelnuts. The ones I got from Trader Joe's came peeled, so it was less prep work for me, but you can always buy them whole, roast and rub off the skins . I thew those into a small food processor and pulsed them down till it looked like sand. Then it was onto the dough. I creamed the butter with the sugar till it was fluffy. Then mixed in the flour and ground hazelnuts till it formed a dough. This dough gets rolled into 4 logs and refrigerated for an hour. Then I took out one log at a time and formed the dough into 8 gram balls. But if you don't have a food scale, its about 1/2 tsp of dough rolled into a ball. 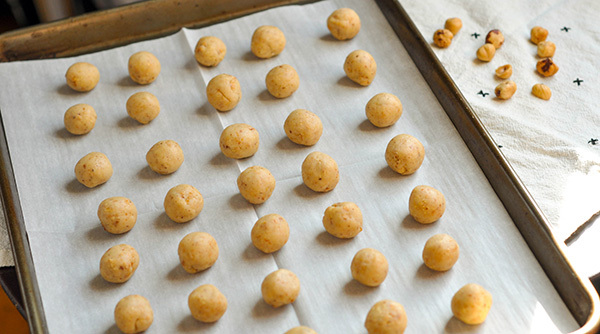 Place these on a parchment lined baking sheet and refrigerate for another hour. Bake them for 15 minutes at 320F till they are a light golden brown. Allow to cool completely, then spread on the nutella and sandwich two cookies together. This cookie is perfect for a cookie swap, or after dinner treat! Place the hazelnuts in a food processor and pulse until they resemble sand. Set Aside. In the bowl of a stand mixer cream the butter and sugar until light and fluffy. Add in the flour and ground hazelnuts and mix until well combined. Divide the dough into quarters and roll into logs. Wrap with plastic wrap and place in the fridge for atleast and hour. Using one roll at a time, take about 1/2 tsp of the dough at a time and into small balls, Place on a parchment lined baking sheet. Put this into the fridge for another hour. Preheat the oven to 320F. Bake the chilled dough for 15-17 minutes or until they are a light golden brown. Allow to cool completely before you fill. Spread about a 1/2 tsp Nutella onto the flat side of the cookie, then sandwich with a second cookie. Enjoy!